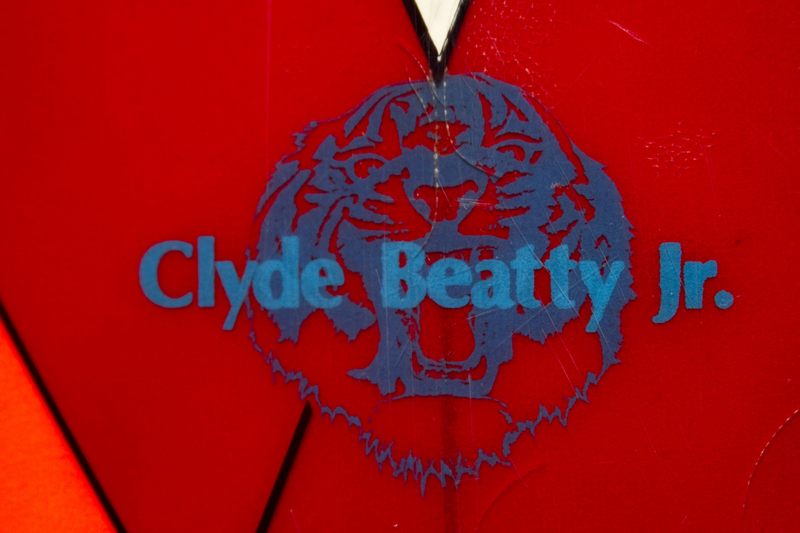 Clyde Beatty Jr. is known for his surfing, shaping and his glassing, in fact Clyde is considered to one o f the first to use epoxy resins on surfboards. When it came to glassing Clyde Beatty was on the creative edge. Clyde first learned how to surf in 1964 at California Street in Ventura. He was in the fifth grade at the time. His first surfboard was a Duke Kahanamoku pop-out made in Ventura, his parents bought it for him. While going to University High School in Pacific Palisades during the latter part of the 60’s Clyde was a team rider for the Hobie / Blue Cheer surf shop in Santa Monica. Mike Perry was the shaper at Blue Cheer and had an influence in Clyde’s shaping. Clyde learned by watching Mike shape a lot of boards including the ones he rode for Blue Cheer. The Blue Cheer factory is where Clyde learned to shape and glass. Being around Mike Perry, and watching glassers like Wayne Miyata gloss and pin line and Bob Petty laminating. Bob was the man who could power when it came to laminating. 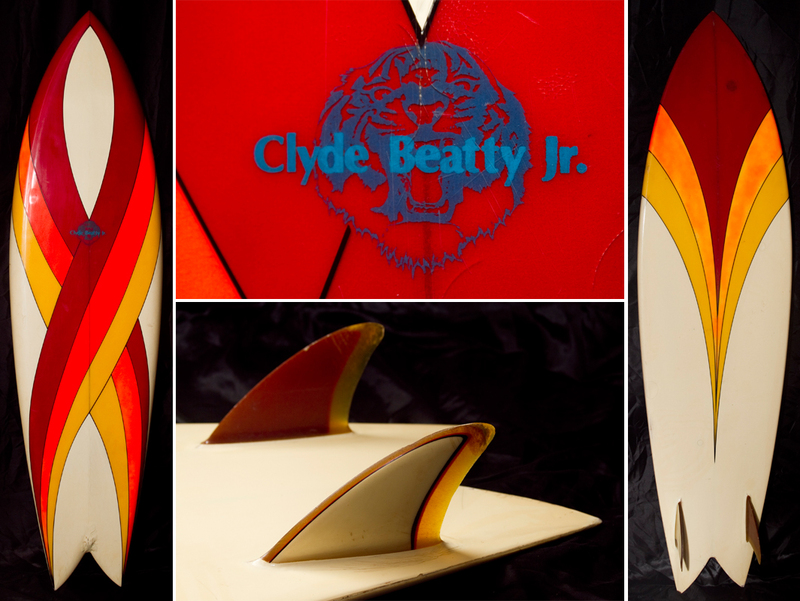 Clyde’s first board that he shaped was also air brushed by him, using a spray enamel can. 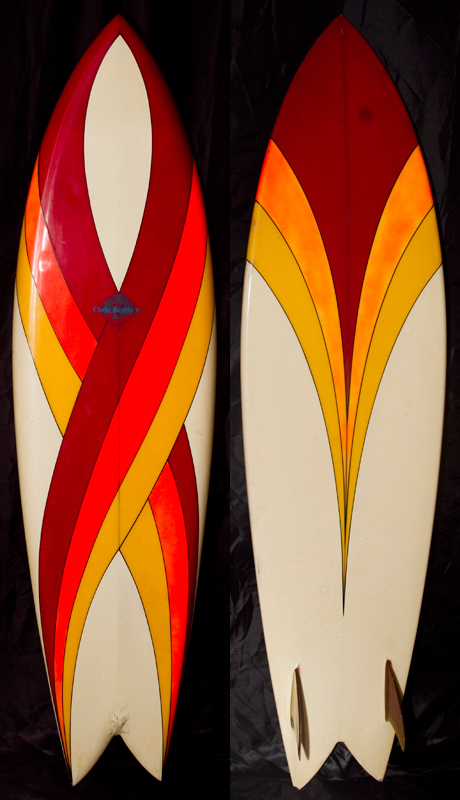 While learning the ropes in board manufacturing, Clyde was a 4A surfer the equivalent of an ASP pro. The Rocket Fish which were called gun fishes before 1974. Clyde and Steve Braum shaped a few modified fishes. They kept refining each board more and more. Clyde’s main focus was surfing, since he was on the contest circuit. As mentioned earlier the gun shape fish became known as the Rocket fish. A design credited to Joey Thomas. 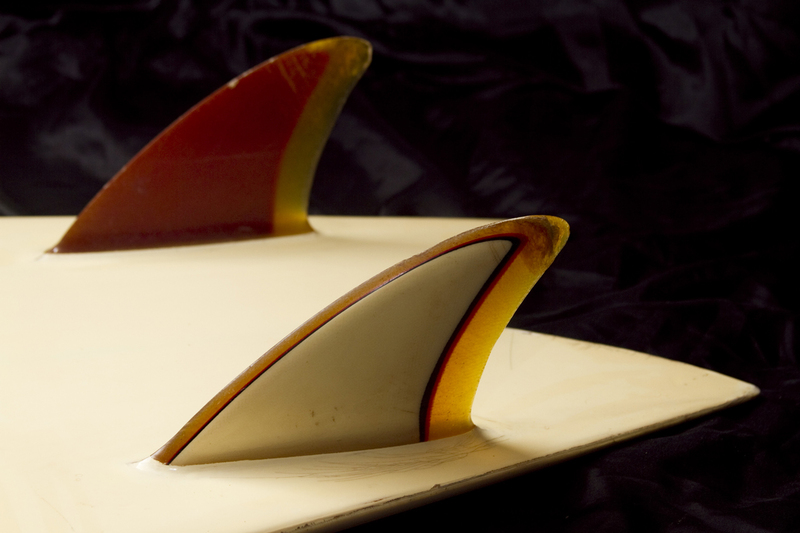 Having glassed some of Brewer’s surfboards, Clyde incorporated the down rail concept into his Rocket Fish designs. It proved to be a match and Clyde’s surfing went up another notch. Clyde has continued making surfboards in the 80’s, 90’s, and 00’s. Now days Clyde calls the rocket fish by a new name the Tiger Fish. Out of necessity to have surfboards for the contest circuit, Clyde learned to make surfboards. His surfing has stayed at a high level through the years and his boards are the reason.